Single Bay USB Charging Cradle Kit (International) Kit Includes: Single Bay USB Charging Cradle (Crd9500-1000ur) and Power supply (Kt-14000-148R). Requires Purchase of Country Specific Three Wire Grounded AC Power Line Cord. 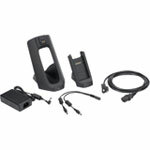 For Communication to A Host Computer Purchase Micro USB Sync Cable (25-124330-01r). Single Bay and Spare Battery Charger Kit (Intl). Incl: Single Bay Cradle (Part# Crd9500-1000ur), One Slot Battery Charger (Part# SAC9500-1000r), Y-cable (Part# 25-122026-01r), and Power supply (Part# Pwrs-14000-148R). Buy Country Specific 3 Wire AC Cord Separately.